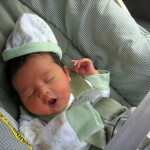 You are here: Home / parenting / Car Seat Safety: Why Rear-Facing? 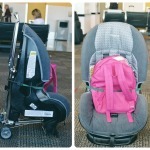 Car Seat Safety: Why Rear-Facing? My daughter is 18 months old and weighs over 25 lbs. 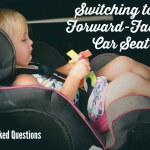 When we get in the car, she rides rear-facing in her car seat and will continue to ride rear-facing as long as 1) she does not exceed the rear-facing weight limit on her seat, and 2) her head doesn’t go over the top of the seat. Her legs are more cramped rear-facing. She can’t see out the window as well, and sometimes, especially after a big meal, this means she gets car sick. The sun gets in her eyes. 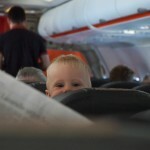 For her general comfort, I can see a lot of reasons for turning her car seat around. Because at 18 months old, my daughter’s head is still much bigger in relation to her neck than an adult’s or even an older child’s. In a car crash, even one at fairly low speeds, her neck is not strong enough to support her head. 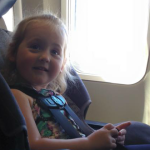 In small children like her, this makes the risk for internal decapitation and serious neck injuries much higher if they ride in forward-facing car seats, which do not support or restrict motion for the head and neck in a crash the way rear-facing car seats do. In fact, the risk of death in a crash is 5 times higher for kids riding forward-facing. I’ve been in a serious car accident before. I know how quickly they can happen and how much damage they can do, even when you’re driving at what you think is a low speed. My accident occurred at 30 mph, but still happened fast enough that I had no idea what had happened until someone explained it to me after the fact and was still serious enough that it totaled my car and left me with nerve damage to my knee that took a year to heal. 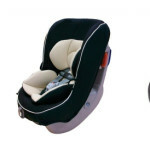 An accident like that with my 18-month old in a forward-facing car seat could have very easily turned into a very serious accident with a serious neck injury for my baby girl. I don’t care if her legs are crunched. I don’t care if the sun is in her eyes. I don’t care if she’d be more comfortable facing forward. What matters most is that she’s safe. I’ve heard people say, “Well, we do forward facing, and we’re all fine!” Most people our parents’ age survived childhoods with no car seats or seat belts at all. We can all agree that the wisdom to draw from that is not that car seats and seat belts are unnecessary, but that our parents were lucky. Considering how much time people spend in their cars and considering how many people are on the roads these days, accidents are overall a fairly uncommon occurrence. However, serious and fatal car accidents happen every single day, and however remote the possibility, they can happen to you and your family. Car accidents are one of the leading causes of death for children and the #1 cause of fatal injuries from accidents in the US. What my experience with a serious accident taught me is you never know if or when you will be in a serious accident. The best you can do is drive safely, cautiously, and take all the safety precautions you can to protect you and your kids.